The color in the picture above is off a good bit. I took it indoors with a flash just a little while ago, but it’s cloudy outside, and without natural light, the colors just aren’t true. The yarn—Knit Picks Wool of the Andes in Mist—is much grayer. It looks far too blue in the picture. 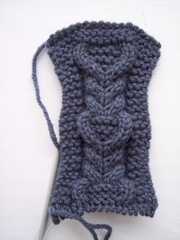 Here’s a photograph of a swatch I did for the sweater that is much closer to the actual color. Isn’t that an awesome cable? Oh, how I love being able to insert pictures in the text with so little effort! Just wait till I get the yarn for my next Fair Isle beanie. I will overload my handful of readers with pictures. 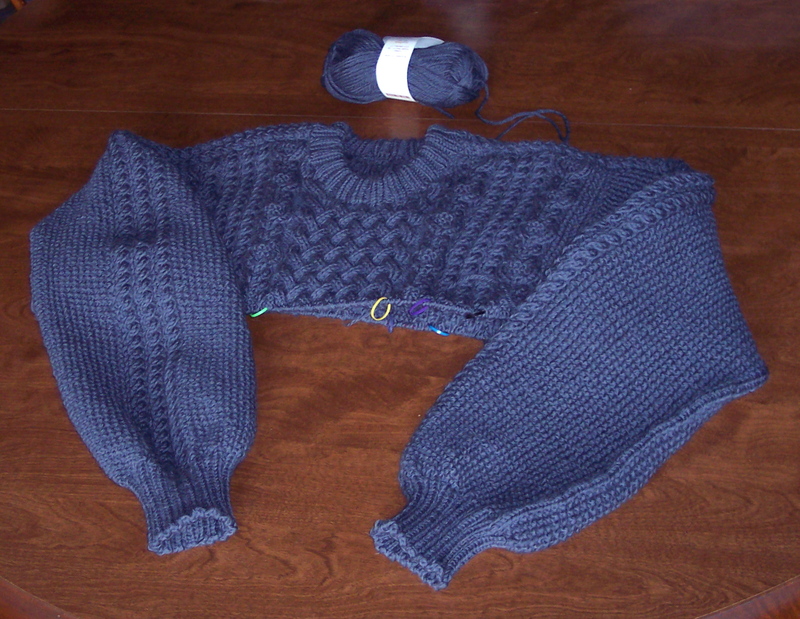 But it will be a few weeks because two of the colors of J & S that I ordered are on backorder. I don’t mind waiting because I have lots of other projects to work on. I always have lots of other projects to work on.